Merde! 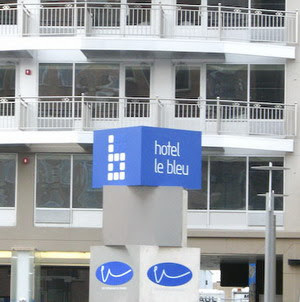 After an original expected opening in early July, we've sat by helplessly as Hotel Le Bleu, the Fourth Avenue boutique hotel sandwiched between the taxi depot and the dialysis clinic, right near the Pep Boys and the Staples, has punted on repeated opening days. And so, the flagship hotel of the Gowanus hotel boom is close, but not there yet. Now, according to newyorkology, which checked Le Bleu's website, the new target date is August 13. Indeed, a look at the site confirms: No reservations until that date. We don't know what happened to those that already had Le Reservation. Room prices are in the mid-$300s per night, although some online rates are $289. So close, yet so very far. McDonald's Smith Street Rumor Confirmed? Who's Responsible for Coney's Ugly Fences?